Our latest cheese addiction is stringy cheese, a popular curd cheese found in Turkish, Syrian, Armenian and related cuisines. If you mention string cheese to most people, they would most likely think of the kids lunchbox favourite of sticks of pull apart processed yellow substance that barely rates being called cheese let alone real food. But this string cheese is far from that. This braided cheese is also known as dil peyniri or örgü peyniri, it has its origins in Turkish and Armenian food, so there are most likely multiple names it goes by. Made by Assala Cheese in wonderful downtown Carramar in Sydney, we picked this up at Hamze Brothers supermarket in Merrylands. It might seem a little pricey at first at around $11 for a pack but there is a load of wonderful pull apart cheese here. There's not much to the ingredients: curd cheese, non animal rennet, brine (water, salt) and black cumin seeds. The non animal rennet make the cheese far more vegetarian and religiously friendly. Once out of the packet, the cheese is held together in a tight braid. Flecks of little black nigella seeds float through the strands. We tried the cheese as part of breakfast, with a soft boiled egg and home grown tomatoes. The salty, squidgy, squeekiness of the cheese was a perfect match. 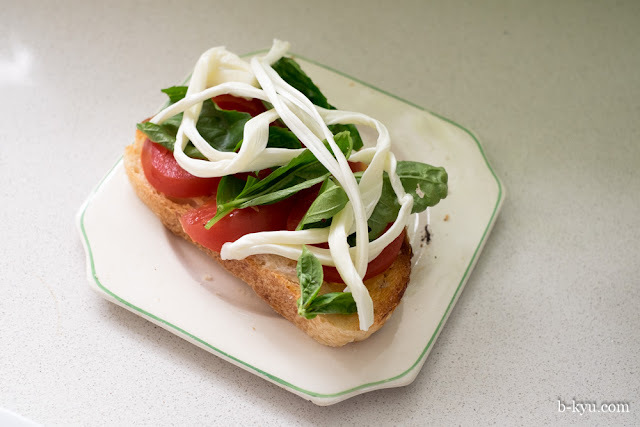 Shawn's contribution to global cuisine, the braided cheese bruschetta: crusty bread with tomato, basil and stringy cheese. He also experimented with slapping some into a mixed cheese toasty and the results were equally as good. We had to stop ourselves stealing to the fridge and breaking off strings for a quick snack. You could also try mixing it with some chilli flakes, dried oregano and oil and marinate for a different flavour. We've spied this cheese in a few other supermarkets in Fairfield, Auburn where fresh yoghurt and cheeses like this and shanklish are sold. Thanks for sharing! Maybe it will suddenly become popular and spread all over the world! I'm totally hunting this down the next time I'm out west! I'm definitely sure you can get this at the fruit and veggie shop on level 5 of Parramatta Westfield, outside Coles and the Asian supermarket. Something I definitely miss since relocating to the UK. Thanks for the tip. What else do you miss now you are there? I've heard many Sydney folk miss the great Thai and Vietnamese we have here.